How do I Buy Art on DPW? Find the art you love by browsing the What's New page to see the art added that day, the Search page to search through all our art, or the Featured page to take a look at the art of our Featured Artists. Click on a painting thumbnail to view it larger. 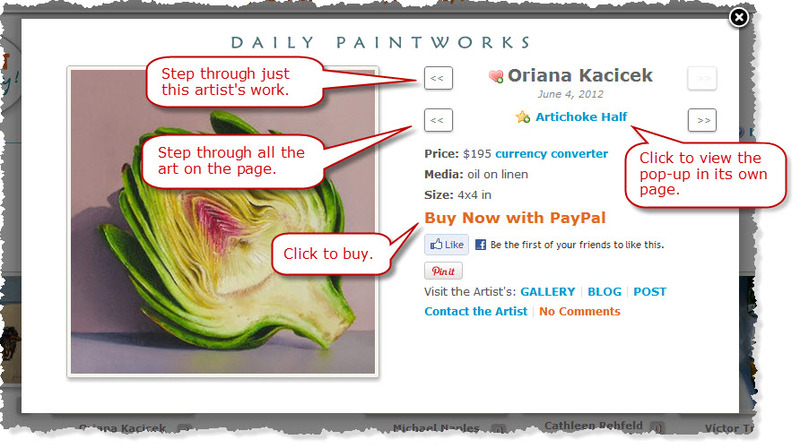 In the pop-up that opens, you can click a link to buy the painting, if it is available. Do I need to be a Member to buy Art? No! If you want to bid in our DPW Auctions, you do need to register, however it is free, quick, and easy. Otherwise, there is no need to be a member or even register. 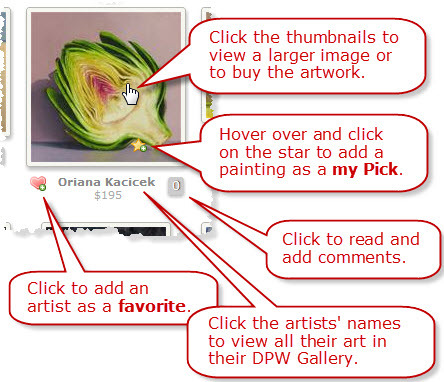 Each artist can choose to sell their work in many different ways - through a Buy it Now link, a DPW Auction, an eBay Auction, Etsy, their blog or website, or through email. When you buy a painting, the purchase is directly between you and the artist and, in almost all cases, it is through PayPal and so is completely safe. The return policy is up to each artist, all of whom are excited about showing and selling their work on DPW and are committed to making their buyers happy. However, in the unlikely case of any issues or misunderstandings, both DPW and PayPal are dedicated to work with the buyer and the artist to resolve them. What is the Daily Email? The DPW Daily Email contains the same paintings as are in the What's New page and is a great way to keep up with the beautiful art our members post everyday. You can subscribe to the email in the upper-right of the website and unsubscribe any time you wish by following the instructions in the email. No worries - we hate spam as much as you do and will never share your email address! Posted - Tue, Oct 9, 2012 at 2:05 PM. This article has been viewed 5153 times.